"Something's way off, all over the country…" Netflix has revealed a trailer for the documentary Saving Capitalism, based on Former Secretary of Labor Robert Reich's book of the same name. His book attempts to provide a more focused concept of how America save itself, fix its economy, and maintain capitalism as the financial system of the country. "As income and wealth go to the top, more Americans are left behind. Now it’s up to those ordinary Americans to change the rules." This seems like one of those nice economics documentaries, kind of like Freakonomics, that attempts to take the big ideas and present them in a way that's understandable and digestible. I'm honestly not fully supportive of the idea of "saving capitalism", but I do support Netflix docs, so I'm featuring this anyway. It's always good to hear all the different arguments. Based on Robert Reich’s 2015 book, the documentary explores the reasons why the economic system that once made America strong is suddenly failing, as well as how it can be fixed. The film is a clear-eyed examination of a political and economic status quo that no longer serves the people, exposing the powerful alliances between Washington and Wall Street, as well as the extreme wealth disparity in our country. Visionary and acute, Saving Capitalism helps build the path toward restoring America’s fundamental promise of opportunity and advancement. Diving deep into the political economic system, this film is not about being democratic or republican, but refocuses the conversation on how we can fix it. 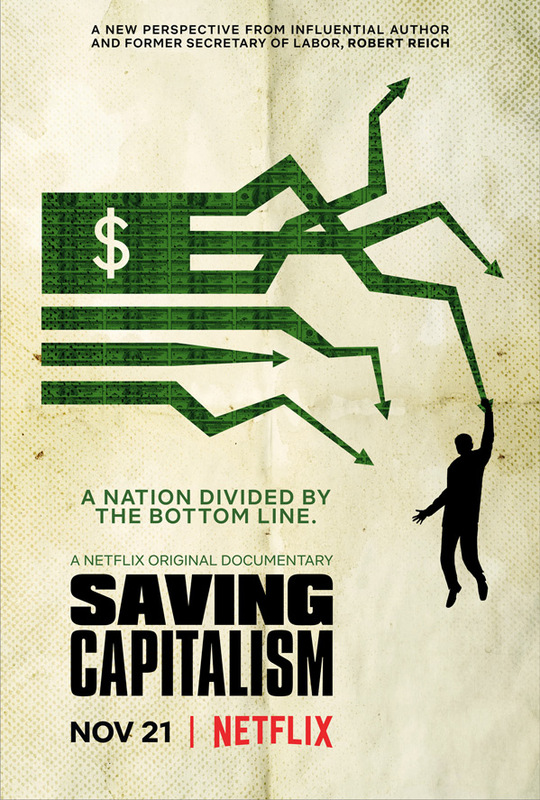 Netflix's Saving Capitalism is co-directed by filmmakers Sari Gilman & Jacob Kornbluth (Inequality for All, Love & Taxes). Netflix will debut Saving Capitalism streaming exclusively starting on November 21st this month.